The Union Home Minister Shri Rajnath Singh chaired a meeting of the Consultative Committee for the Ministry of Home Affairs on “LWE related issues” here today. Shri Rajnath Singh informed the members that the Left Wing Extremism (LWE) scenario, while remaining an area of concern for internal security of the country, exhibits significant improvement over the years and the declining trend continued in the last three years. As compared to data of 2010, 2016 reflected a decline of 53% in number of violent incidents and 72% in resultant deaths and the trend continued in 2017, the Home Minister added. Shri Rajnath Singh further informed the members that This year overall situation so far also indicates a declining trend and the number of violent incidents has declined by 25.6% as compared to corresponding period of 2016. Shri Rajnath Singh informed the members that there are 106 districts in 10 states affected by LWE and 35 districts are identified as most affected districts in seven states. He also informed the members that a new initiative SAMADHAN (S-Smart Policing and Leadership; A –Aggressive Strategy, M-Motivation and Training, A-Actionable Intelligence; D-Dashboard for Development and Key Performance Indicators, H-Harnessing Technology for Development and Security, A-Action Plan for each Theatre and N-No access to Financing) has also been introduced to control the situation in the LWE affected states. The members participated in the detailed discussion on the subject and appreciated the work of the Ministry of Home Affairs in controlling the situation in LWE affected states. The use of technology, intelligence sharing and specialized training for the forces was also discussed. Some of the members mentioned that LWE problem is not a ‘law and order’ problem alone but is also a socio-economic problem. There is a need for adopting a sustained policy and intelligence sharing in the LWE affected States. They also suggested that the police should be further strengthened with the use of better communication and connectivity facilities. The Union Home Minister informed the members that their valuable suggestions have been noted for appropriate action and further improving the situation. He mentioned that the Centre has been doing proper monitoring with the necessary assistance of the states by empowering the states with the financial assistance and security forces with proper training, technology and latest equipment. He said that the joint operations of CAPFs and state police have given good results in the recent past and hoped that the situation will further improve in the near future. Shri Rajnath Singh also informed the members about the security related measures which included the deployment of CAPF battalions in the LWE affected States, use of 56 Specialized India Reserve Battalions / India Reserve Battalions mainly to strengthen the security apparatus, construction of about 400 Fortified Police Stations and various training related initiatives. Shri Rajnath Singh also informed them about other security related measures such as UAVs, helicopters, Unified Command and Joint Command and Control Centers at Jagdalpur and Gaya. 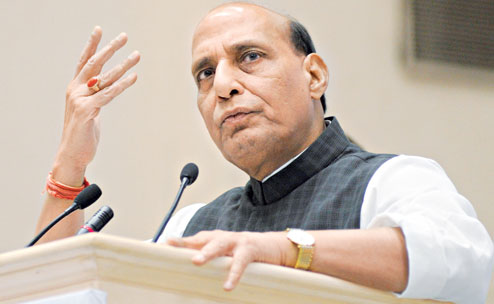 Shri Rajnath Singh informed that 743 Scheduled Tribes candidates from 4 most affected LWE districts of Chhattisgarh-Bijapur, Dantewada, Narayanpur and Sukma have been recruited in Bastariya Battallion in order to enhance local representation in Security Forces. He mentioned that the opening of Kendriya Vidyalayas and Skill Development Centres in LWE affected districts are other development measures. He informed that 1,789 new branch post offices, 405 bank branches and 818 ATMs have also been opened in 35 most LWE affected districts during the last two years. Under Road Requirement Plan-I (RRP-I) construction of 4,447 km roads has been completed out of 5,422 km road envisaged under the Plan till July 31, 2017. A new Plan, ie Road Connectivity Project for LWE affected areas (RRP-II), has been approved which envisages construction of 5,412 km roads and 126 bridges in 44 districts of LWE affected States at an estimated cost of Rs.11,725 crores. The details of 2,199 mobile towers installed in LWE affected states and additional 2726 mobile towers in Phase –II of the scheme were also discussed with the members. The use of community radio stations and media plan for spreading awareness and to counter the false propaganda of the Maoists was discussed in the meeting. Dr. Bhagirath Prasad, Shri Devendra (alias) Bhole Singh, Smt. Geetha Kothapalli, Shri Hukum Singh, Shri Kirti (Jha) Azad, Shri Mulayam Singh Yadav, Dr. Thokchom Meinya, Shri T.G. Venkatesh Babu from Lok Sabha and Shri Bhubaneswar Kalita, Dr. K. Keshava Rao, Shri Mukul Roy, Shri Pratap Singh Bajwa, Prof. Ram Gopal Yadav and Smt. Ranee Narah from Rajya Sabha attended the meeting. Ministers of State for Home Affairs Shri Hansraj Gangaram Ahir and Shri Kiren Rijiju, Officer on Special Duty Shri Rajiv Gauba and senior officers of MHA and CAPFs were also present in the meeting. This year overall situation so far also indicates a declining trend and the number of violent incidents has declined by 25.6% as compared to corresponding period of 2016.